Virginia Wantz and her granddaughter, Autumn Schaffer, thank medically retired Army Sgt. 1st Class Carl Morgan for his military service at a rest stop in Pennsylvania during the World T.E.A.M.’s Face of America ride, April 24, 2016. More than 700 cyclists, 175 of them disabled veterans, rode 110 to 120 miles from either Arlington, Va., or Valley Forge, Penn., to Gettysburg over two days. More than 700 cyclists, including nearly 175 disabled veterans, rode two routes — either 110 miles from Arlington, Va., or 120 miles from Valley Forge, Penn., — and met up in Gettysburg, Penn., as part of World T.E.A.M. Sports’ annual “Face of America” ride. The cyclists dealt with a bit of cold rain the first day and had a few injuries and mechanical issues, but the sun came out, and they had nice weather for the Gettysburg finish. The ride is one of the largest annual noncompetitive bicycle rides in the national capital region. It gives veterans of all eras from all over the nation with various disabilities a chance to meet up, make new friends and share resources. 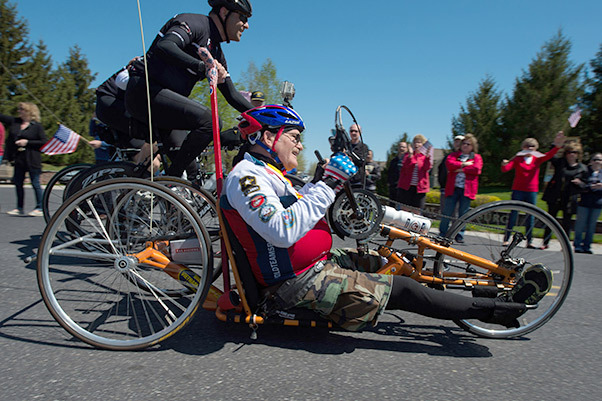 For Bill Czyzewski, an Army Vietnam veteran who served with the 11th Armored Cavalry Regiment as a tank loader, cycling became his rehabilitation for his post-traumatic stress. Czyzewski was shot March 1, 1970, seven months after his arrival in Vietnam. He lost his left leg seven years later. He said World T.E.A.M. Sports encouraged him to do a 60-mile ride. Then he did the Face of America ride, he said, and then the next year, he went cross-country. He said he loves participating in the Face of America ride because now he can help younger veterans with their PTSD. Retired Army Sgt. Albert Gonzalez sets pace for the Rescue 22 team during the Face of America bike ride in Gettysburg, Pa., April 24, 2016. 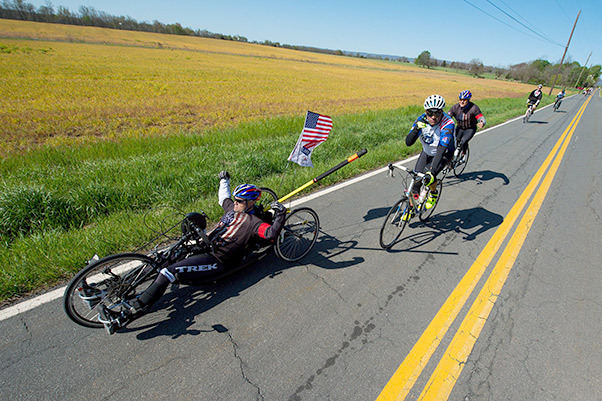 More than 150 disabled veteran cyclists were paired amongst 600 able-bodied cyclists to ride 110 miles from Arlington, Va., to Gettysburg over two days in honor of veterans and military members. He said he dedicated his Face of America ride to a fellow San Antonio police department worker who recently took his life. Gonzalez was riding with Team Rescue 22 in memory of the 22 veterans who take their lives each day. Gonzalez said he rides with Face of America for the camaraderie. He said he also enjoys hearing the stories from veterans from other eras. Carl Morgan, a medically retired Army sergeant first class computer specialist and observer controller who has a spinal cord injury, said he also enjoys riding alongside veterans of all eras. Morgan, who rides a hand cycle, said he also just enjoys riding. “The opportunity to come out here and see the countryside, this is what we fought for, and to get a good look at it firsthand, it’s great. It’s a great ride,” he said. Vietnam War Army veteran Bill Czyzewski rides a recumbent bicycle to the applause of a crowd in Gettysburg, Penn., April 24, 2016. More than 150 disabled veteran cyclists were paired amongst 600 able-bodied cyclists to ride 110 miles from Arlington, Va., to Gettysburg over two days in honor of veterans and military members. The riders stopped every 10 to 20 miles along the way for 20-minute breaks and received snacks and cheers from volunteers and community members. Autumn Schaffer, 8, daughter of Nathan Schaffer, who served in the Army in Afghanistan and Iraq, and her grandmother, Virginia Wantz, stopped by to thank the veterans with their church group at one of the stops in Pennsylvania. “I think it’s really cool that they can still ride bikes,” Schaffer said. Jose Santiago, A former Army corporal combat medic who has PTSD from his time in Iraq from 2003 to 2004 and a traumatic brain injury, leads a team of about 50 cyclists — 25 percent of them are from Puerto Rico. He said Face of America is like a family reunion, and that he has seen the impact rides like Face of America has had on some of his riders. Medically retired Army Sgt. Norberto Roman, a cargo specialist with PTSD and chronic bronchitis from deployments to Iraq from 2003 to 2004 and from 2004 to 2005 had a special mission this year. 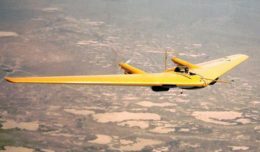 He led a Rescue 22 team on a memorial ride. Each of his riders who were veterans from each branch of the military wore a photo of a service member who had taken his or her life. He said they also didn’t leave anyone behind on the ride. Medically retired Navy Petty Officer 1st Class Jerry Padgett II, a search and rescue emergency medical technician, has a spinal injury and TBI from an improvised explosive device blast in Afghanistan. He encourages any veterans who may be considering participating in Face of America to give it a try. Retired Navy Petty Officer 1st Class Jerry Padgett II, front, sets a pace for his team during the Face of America bike ride in Gettysburg, Pa., April 24, 2016. 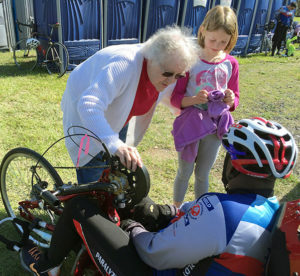 More than 150 disabled veteran cyclists were paired among 600 able-bodied cyclists to ride 110 miles from Arlington, Va., to Gettysburg over two days in honor of veterans and military members. “If not FOA, go out to your local park and recs and find out if they have any adaptive sports,” he said. “You just have to make the effort and know that you’re not alone and to connect. The only one true disability in life is the lack of communication. I was told I wouldn’t walk and talk again, but I’m talking.